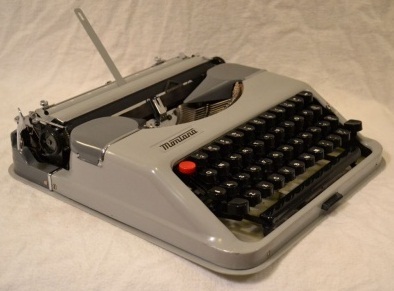 I’ve lost count of the number of typewriter companies (many of them relatively short-lived) which were allowed to build Paillard machines – there are just so many variations of the Hermes Baby out there, it would be hard to keep track of them all. Still, I’m most proud to show off my Montana Luxe, especially because of its unique bright red keyboard. I have long been drawn to the more distinctive and later Montana design, perhaps better known in the US as the Carlton. But while the Luxe is just another Baby, it is nonetheless a very beautiful Baby. And great to type with, too. 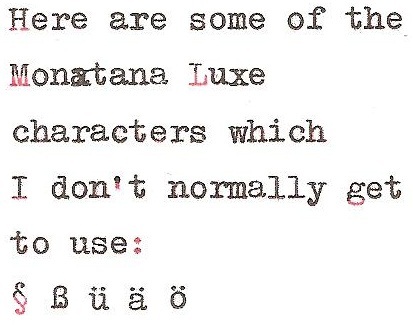 On his Portable Typewriter Reference Site, Will Davis says the Turin typewriter company Montana “was launched [in 1950] for the singular purpose of manufacturing perfect license-built copies of the early version of the Hermes Baby. A very nice Baby indeed! Is it not too hot to type on it? I see it even speaks Deutsch. What's the serial number? Very very nice machine! I have to have one. Especially since it has the same name as my favorite state. Way down near the bottom of Georg's excellent Hermes Baby compendium, you'll find a Turin-made Viking name variant that I turned up. It's a rebadge of a rebadge! It does differ from other Baby's in one unusual way: the ribbon selector switch is situated above the keys and not alongside them. Thank you Georg, notagain, Bill, Richard and Alan for your comments. Bill, not sure how you'll get one, but they must be out there somewhere!